But every now and then a student does seem to appreciate that, in their estimation, you seem to have given things your best shot and might make some kind of gesture to affirm this. The current graduating class of A level students include a young lady called Clarinde Esculier who I have taught Biology to since she joined the school a couple of years ago. She is a lovely girl and a really talented student. At the end of June after the formalities of the school´s speech day ceremony, when the teachers and students and their families were having a chin wag at the bar, Clarinde gave me a lovely picture that she had drawn of a fish. 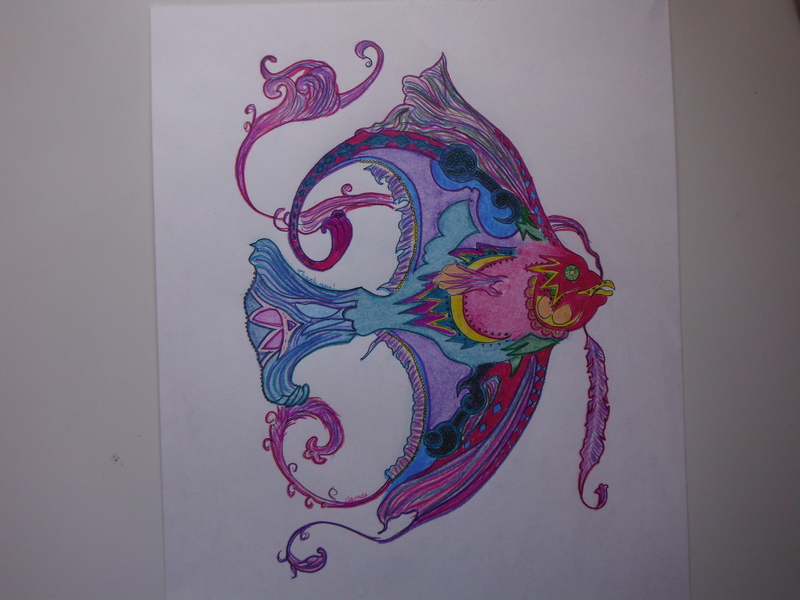 She knows I am nuts about fish and fishing and am interested in painting fish myself. I really love this picture. It must have taken her a long time to do since it is exquisitely detailed. When I asked her to sign it she told me that she had already done so and pointed out where she had written her name in tiny letters. If I had made a drawing as good as this my name would have been written much bigger! Equally small and easy to miss, lying just above the fish´s tail, are the words “Thank You”. Here is me standing between two smart and glamorous young ladies (it doesn´t happen often!). Clarinde on the left of the picture is off to London to study Biomedical Science and Théa, on the right, is off to study Natural Sciences at Cambridge.